The majority of you probably have no idea what you’re looking at. That’s perfectly understandable. I’m actually none too proud to admit that I can identify this at first glance, myself. 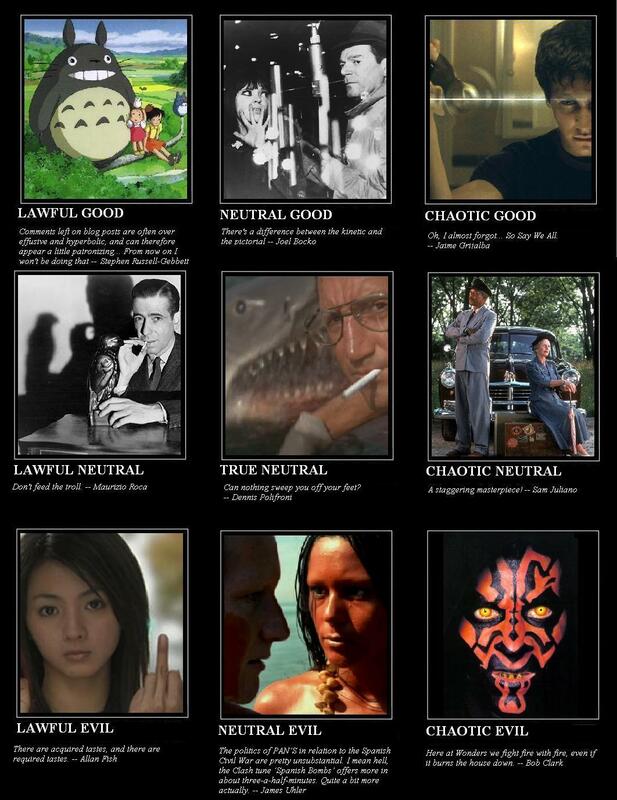 If you’ve ever played a tabletop role-playing game, or if you’ve merely browsed the Internet enough for its various memes to work their way into your very gene pool, you’ll know that the above image is called an “alignment chart”. Used for the purposes of creating fantastical characters in Dungeons & Dragons and various related games, it’s intended to provide a sense of easily expressed identity for the various fictional personas that get tossed about on so many epic, imaginary quests. With its three-by-three grid, one can fit themselves into any moral/behavioral coordinates they see fit, and decide not only whether or not to play as a face or a heel, but what kind of face or heel. Proportionally, it works on a rather simple mathematical scale, with the conditions of “lawfulness” applied to the left-hand of the matrix, “neutrality” to its middle and “chaos” to its right, as a means of assigning codes of behavior. At the same time, it uses a no-brainer association of “good” at the top and “evil” at the bottom, with another “neutrality” in between. In other words, morality is graphed on the vertical axis, and behavior on the horizontal, and in this way one can chart the relative position of one’s personality in the same manner that students were tasted to rate poetry before Robin Williams asked them to start ripping out pages in Dead Poet Society. The alternate-history is an interesting sub-genre of science fiction, and one that you don’t see all too often in anime. Imagining a different path that the past might have taken is usually overlooked in favor of attempting to foresee where the future might take us, even if it’s only done in leaps and strides so short that we’re bound to catch up with the date in question in about a decade. Yet there’s a potential for ripe nostalgia in that hazy look at history’s lost potential that particular narrative facet affords, a chance to detour from the more traveled, trodden path for a more meandering, personal look at everything that makes us what we are. It’s an especially apt genre for focusing on the trials and tribulations of youth, full of all kinds of joys and regrets that the adult imagination cannot help but revisit endlessly in so many loops over the years, forever wishing to reclaim some storied glory from yesterdays long past or redo some awful episode so long ago that it always feels just minutes past. When last year’s Never Let Me Go was released, one might’ve wondered why that tale of cloned-children raised to the cruel fate of parceling out their internal organs one by one would be set in a not-too-different past instead of a not-too-distant future, but indeed it’s the very fact that the story was set in a recognizable version of our history that it was possible for audiences to have that much easier a time identifying with the pangs and longings everyone of those genetically bred adolescents felt for the smallest privilege of time they’d been given before the falling of the axe. Alternate-histories arrive with their own automatic sense of revisionist nostalgia, yet one that is all too often used only for epic concerns– the battles lost that ought to have been won, the nations standing fallen that ought to rise again. Rarely do we see it used to examine personal failures and victories in quite the same way, and if we do, it usually falls down the slippery rabbit hole of so much sentimentality, that there’s little wonder we wind up retreating back to into the shells of so many Turtledoves.